I will admit that I haven’t jumped on the pumpkin-craze bandwagon as of yet, but when I made these pumpkin muffins I understood the mayhem. These healthy pumpkin muffins use coconut oil and all the amazing spices that remind me of fall weather. Make them and you’ll understand the pumpkin craze too. With fall arriving in full force here in Minnesota I have adopted cozy sweaters, cute boots and pumpkin muffins. We try to eat healthy and replacing butter and oils with organic coconut oil has been a favorite trick of mine. 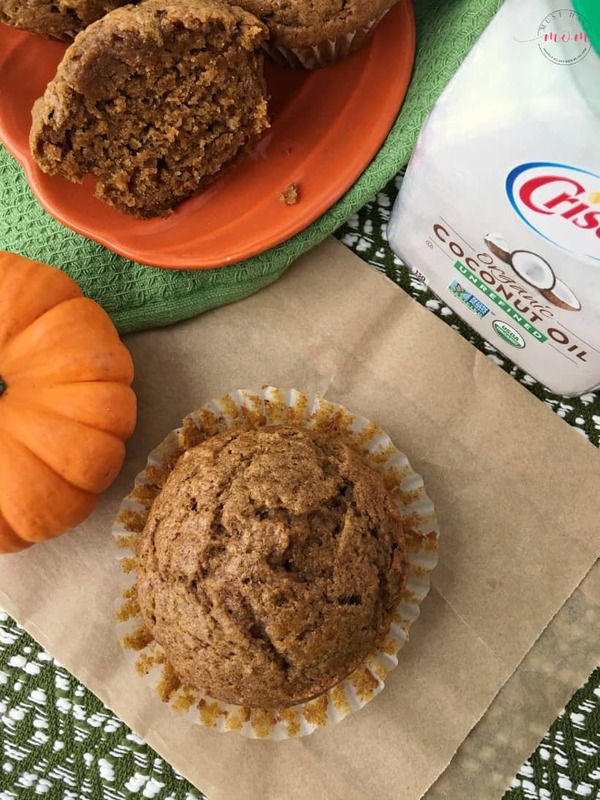 These healthy pumpkin muffins use Crisco® Unrefined Organic Coconut Oil, organic pumpkin puree, aromatic spices and basic baking ingredients to produce a moist, flavor-packed muffin that everyone in the family will love! 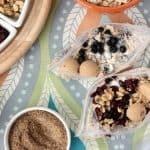 They are perfect for a quick on-the-go breakfast option or to pack in your child’s lunch! They won’t last long though so make sure you grab one before the rest of the family devours them. 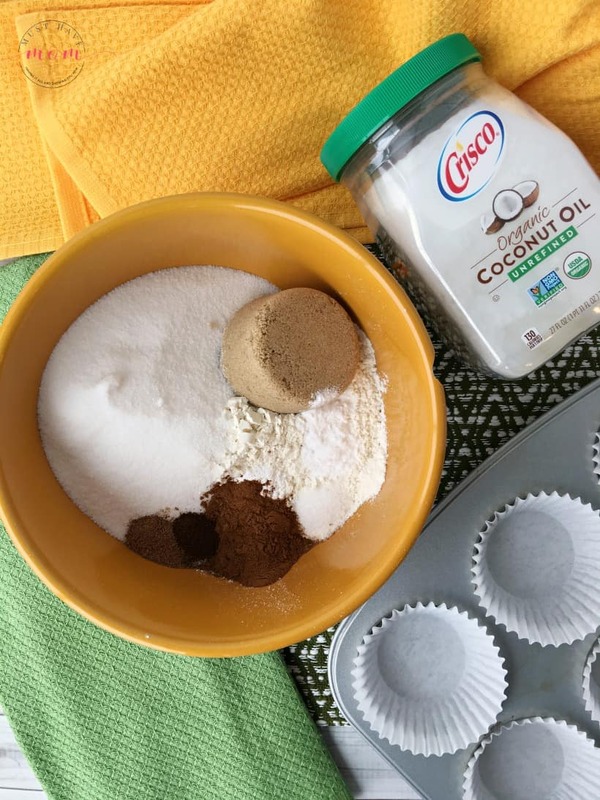 You can find the Crisco Organic Unrefined Coconut Oil that I used in this recipe at Target (there is even a 25% off cartwheel coupon right now so you can save on it too!). While I knew that coconut oil is a great organic substitute for butter, margarine, or other oils, I wasn’t ever sure what the difference between refined coconut oil and unrefined coconut oil was. If you are like me and don’t know then I’ve got the answer for you! 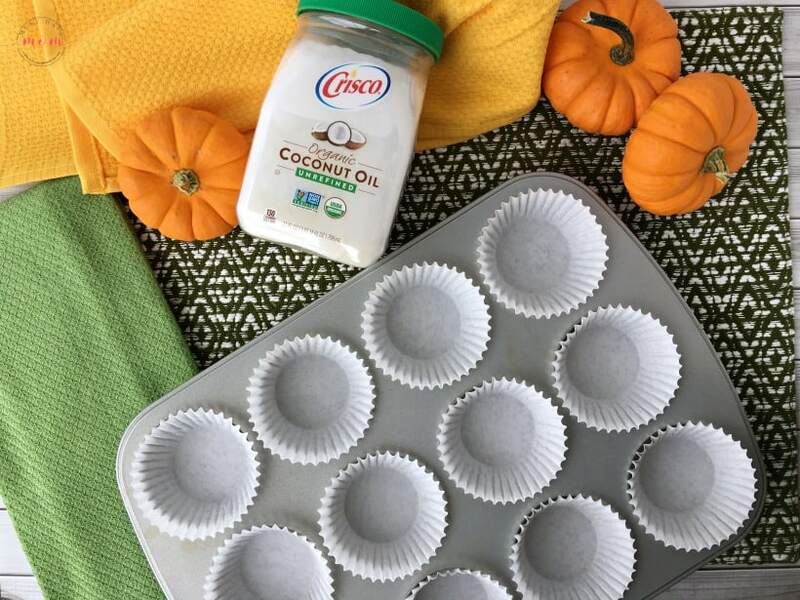 Refined Coconut Oil has no flavor or aroma, so you can add Crisco® Coconut Oil to your recipes without the taste or smell of coconut. Unrefined Coconut Oil retains the distinct coconut flavor and odor. 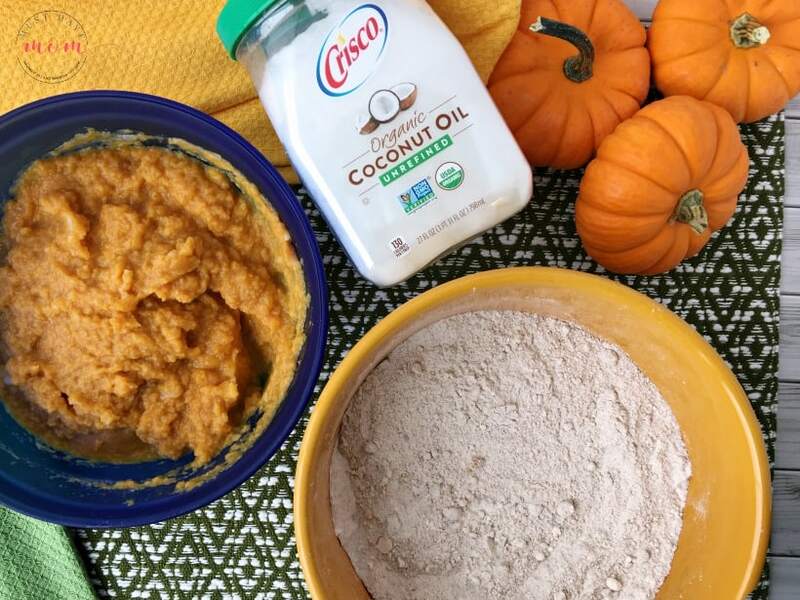 In this recipe, I use unrefined coconut oil and it is a great addition to the flavor! Begin by putting paper liners in a muffin pan. Next, mix together flour, sugar, brown sugar, baking soda, baking powder, salt and spices in a medium bowl. Whisk together to combine. Set aside. 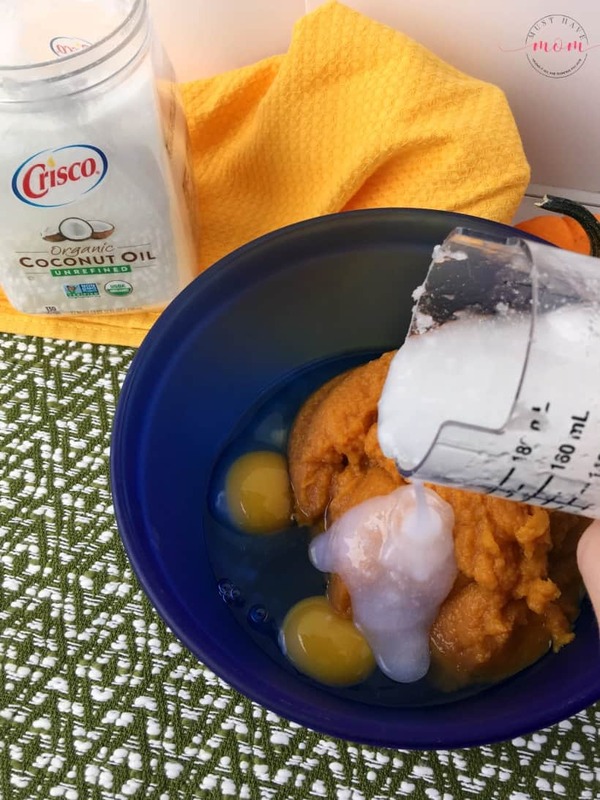 Now, mix together the wet ingredients including the eggs, pumpkin puree, coconut oil, milk, and vanilla extract. You may need to heat the coconut oil to soften it and melt it, depending on the temperature of your house. Coconut oil fluctuates between a liquid and a solid depending on the temperature. It is perfectly normal for coconut oil to become liquid when it is warm and solid when it is cool. You can just warm it up to melt it and measure it out correctly. Mix to combine ingredients. Next, combine the dry and wet ingredients together and mix well. Use a cookie scoop to divide the dough equally between 12 muffin liners. Bake for 22-24 minutes at 375 degrees F or until a toothpick inserted in the center comes out clean. Let cool for 10 minutes and then remove from pan and serve. 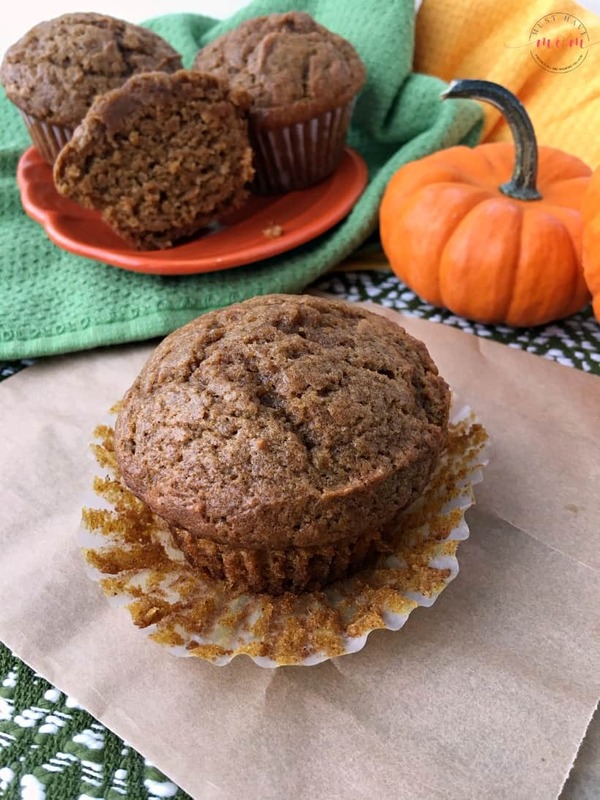 Healthy pumpkin muffins that use wholesome ingredients to produce a moist, flavor-packed muffin that the whole family will love! Preheat oven to 375 degrees F. Line muffin pan with paper liners or grease with non-stick spray. Combine flour, sugar, brown sugar, baking soda, baking powder, salt and spices in a medium bowl. Whisk to combine. Set aside. 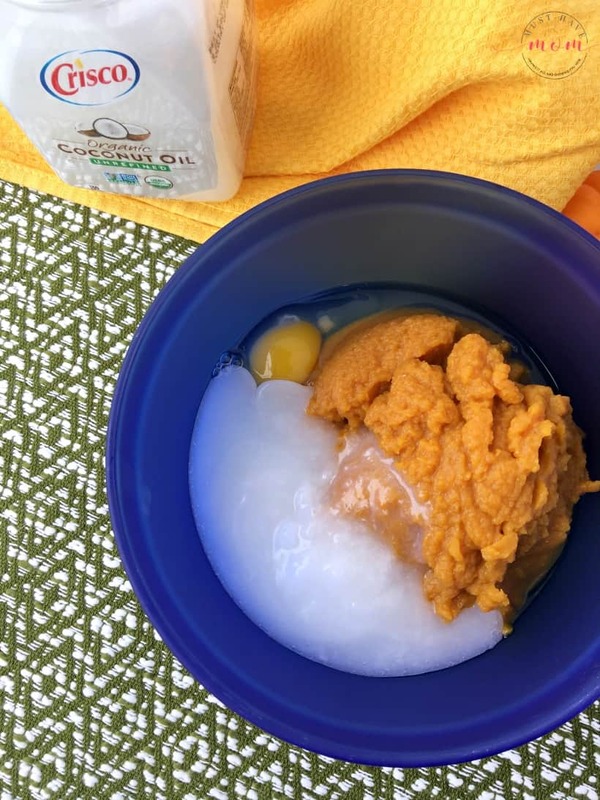 In a separate large bowl combine eggs, pumpkin puree, coconut oil, milk and vanilla extract. *You may need to heat coconut oil to liquify and measure it. Mix to combine. Fold together wet and dry ingredients and mix together well. Use a cookie scoop to divide the batter evenly amongst 12 muffin pan liners. Bake for 22-24 minutes or until toothpick inserted in center comes out clean. Let cool 10 minutes and then remove from pan and serve. Whoa. Crisco makes coconut oil!? That’s freakin’ AWESOME! I’m totally buying some. I love this recipe – my Fall tastebuds are thanking you! 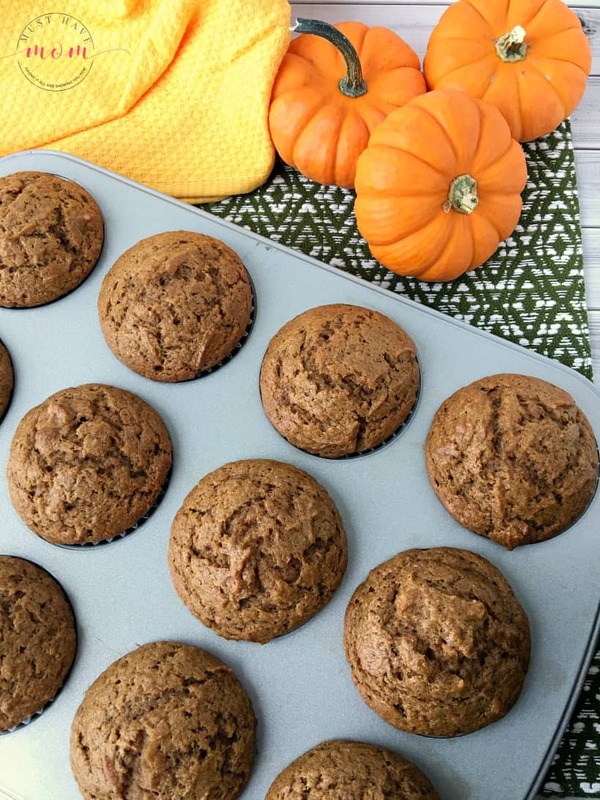 These Pumpkin muffins sound like the perfect fall dessert! They would also be great in lunch boxes as a treat! I had no idea that Crisco made Coconut oil! This changes EVERYTHING. I can’t wait to try those muffins. I”ve been using Crisco for years, so I would absolutely be all over Crisco coconut oil! I’m a big fan of healthier eating, and this is certainly healthier! Those look absolutely fantastic! I am trying to eat healthier and I already have the coconut oil! I will be trying this recipe! These look super yummy. Pumpkin muffins are my favorite! Those look really good. I love just about anything with pumpkin. I’ll have to make these soon. I love making pumpkin stuff this time of year. 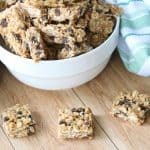 These look good and are very similar to a recipe I use. I love using coconut oil in my baked goods recipes. Wow what an awesome recipe. Great ingredients. 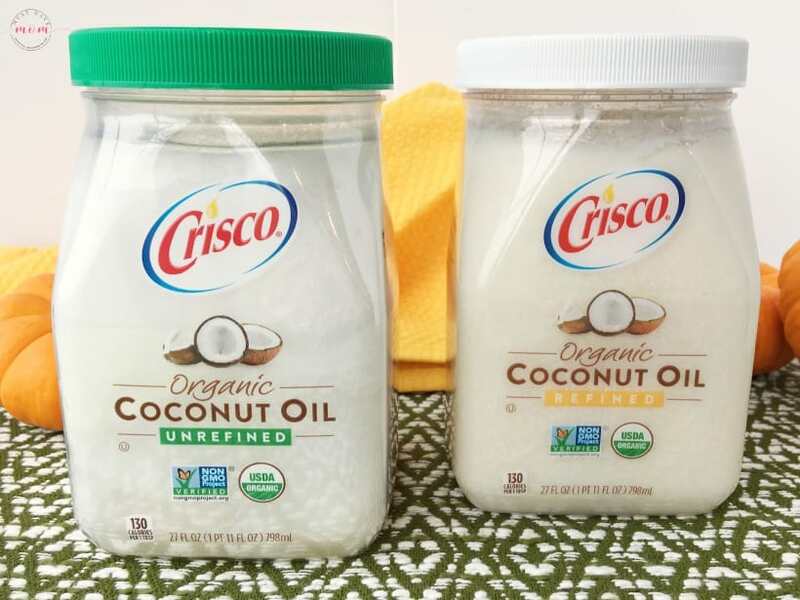 I had no idea that Crisco made coconut oil! Wow! 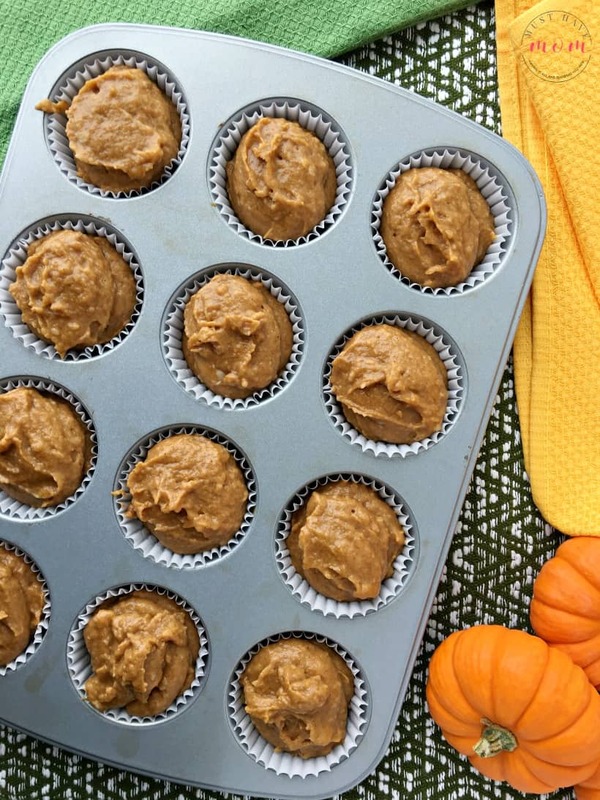 These pumpkin muffins sound like the perfect fall treat! Oh how I love this time of year. I am a fan of all things pumpkin. These look wonderful. The substitution of coconut oil is genius! I appreciate it when I find a great recipe that is a healthier version of something I already love. I never knew the difference between refined and unrefined coconut oil. I need to pick up some refined coconut oil. These pumpkin muffins look like they are amazing. 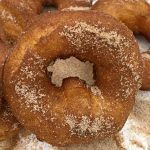 This is one of my favorite foods offered during the Fall and I would love to make them myself. I love that these are healthy for you. Whenever I get pumpkin muffins from my favorite breakfast spot, they have got to be loaded with so much other stuff I definitely don’t need. I have been using coconut oil in a lot of my recipes. 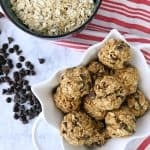 I am always looking for healthy treats to give my family. These pumpkin muffins look so delicious and easy to make. I am sure they will be a bog hit. I basically only cook with coconut oil these days. It has a nice texture and flavor! YUM! 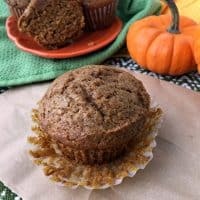 My Kids love fall because they get to make their favorite pumpkin muffins. We also do a Spice Bars recipe. Ill have to switch out their muffin recipe with this one. Mmmmh, these look so good! I think I would use whole grain flour to make it even more healthy though 🙂 Happy Friday! I did not know that Crisco makes coconut oil. I love these Pumpkin Muffins and I want to make them for the kids. I bet they are delicious! We love muffins and these look so yummy. I have never used coconut oil before, I will have to try these. I love everything pumpkin this time of year. These sound delicious, I will definitely be trying this recipe.